The fresh urbane appeal of these high quality backless courtyard benches will look great just about anywhere they are placed. 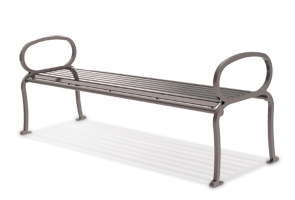 The all steel construction makes these benches super durable while the premiere finish not only looks great but protects against pitting, staining and rusting. Models are available with and without end arms, single center arms and double center arms. Legs have footings with pre-drilled holes for easy surface mounting.